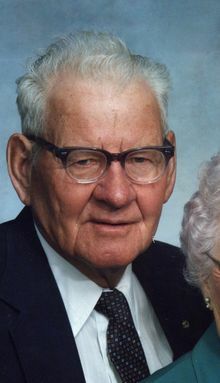 N.H. "Nick" Campbell died January 29, 2007 at the Mount Ayr Health Care Center, at the age of 91. Nick ws born April 25, 1915 in Mildred, Colorado to William & Mabel (Eastin) Campbell. After graduation from high school in Kirk, Colorado he moved back to Iowa. On February 23, 1937 he was married to Georgia Dale Webb with 2 sons being born to this union, Larry and Alan. Nick farmed near Kellerton, IA until his retirement. Nick was very active as a member in the Kellerton United Methodist Church, Methodist Men,the Masonic Topaz Lodge #438, Eastern Star Lodge #478, the Kellerton Lions, Ringgold County Farm Bureau and the Ringgold County Farm Bureau. Surviving Nick are his wife Georgia of Mount Ayr, son Larry Campbell and significant other Linda Wilt of Mount Ayr, 3 grandchildren, 3 great grandchildren and 2 step great grandchildren; brother Glenn (Helen) Campbell of Mounbt Ayr and sister Phyllis (Pete) Daniels of Leon, IA. He was preceded in death by his paretns, son Alan, brothers Dorn and Kenneth and sister Corrine and her husband Bud Hamaker.